For more information see: Setting Up Security Profiles. Password Complexity Requirements: Determines what types of characters must be included in a valid password. A checked box will require at least one character of the specified type. If no boxes are checked, then there are no complexity requirements. 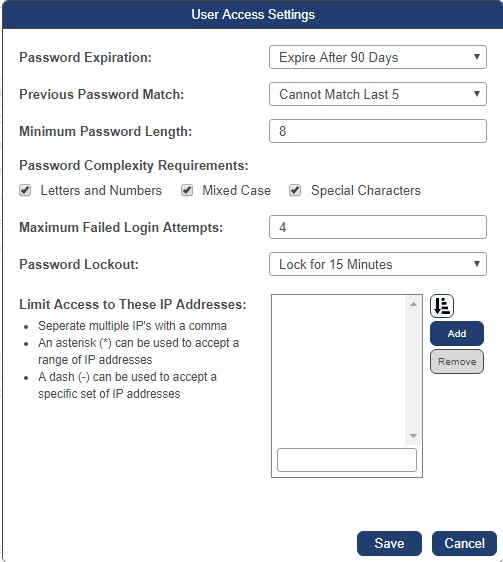 Password Lockout: Determines the length of an account lock-out before the user is allowed to retry a login. The Lock Until Removed option will require a system administrator from your bank to manually intervene for locked accounts. Limit Access to These IP Addresses: Restricts user's PrecisionLender access to only the specified IP addresses. These will be added to your bank's IP address whitelist. The 'remove' button will turn blue when you select a previously added IP address, allowing you to remove that IP address from your bank's whitelist. Exercise caution before using IP Address Filters to ensure that you do not accidentally prevent logins from your current location, unless that is your goal. An Asterisk (*) may be used as a wild card to accept a range of IP addresses. A Dash (-) may be used to accept a more specific range of IP addresses. For example: A range of 127.10.23.50-95 denotes that logins will be allowed for IP addresses 127.10.23.50 through 127.10.23.95. If you accidentally lock out your location by mistake, please contact our support department for assistance. Click on their Username in the Users section. Check the Exempt From IP Address Filters box. This user will then be allowed to log into their PrecisionLender account from any IP address, regardless of your filter settings.